VATICAN CITY (CNS) — The courage and joyful witness of young men and women in the church are needed to help their fellow youths to look toward the future with hope, Pope Francis said. 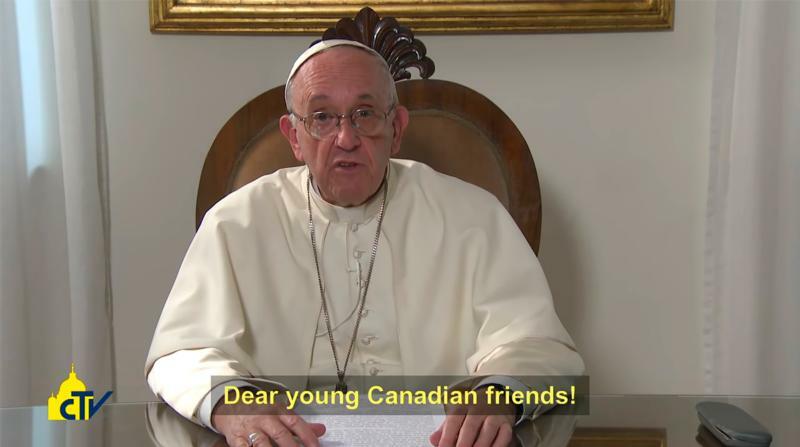 Young people must listen to the cry of their peers today “who seek freedom, work, study and a chance to make sense of their lives,” the pope said Oct. 22 in a video message to participants in the Canadian National Youth Forum. The world and the church need young people with courage — young people “who are not cowed in the face of difficulties, who face their trials and keep their eyes and hearts open to reality” — so that they can work to ensure “no one is rejected or subjected to injustice, to violence or deprived of human dignity,” he said. The televised forum, sponsored by Canada’s Salt and Light Television, aimed to engage “dialogue around the challenges, issues, questions and needs of young people in the Catholic Church” in preparation for the Synod of Bishops on youth in 2018, according Salt and Light’s website. “Do not raise walls of division! Build bridges, like this extraordinary one that you are crossing in spirit,” he said. Like Mary, called by God in her youth, young men and women can say, “Here I am” to the mission entrusted to them, the pope said. “Dear young people of Canada, my hope for you is that your meeting should be like that of the first disciples, that the beauty of a life realized in following the Lord might open wide before you,” he said.